Full Description: The 'Résidence La Grive' is situated in the much sought-after ski resort of Chamrousse. 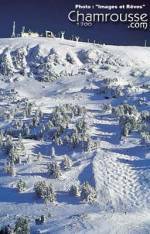 One of the reasons for this resort's popularity is the fact that is lies only 30 minutes from Grenoble and one hour from Lyon, hence reducing transfer times quite considerably, while still giving a choice of two nearby airports. The residence lies only 200m from the slopes, 200m from the kiddies snow garden and 300m from the shops. One of the spellbinding features of this magnificent building is its location and orientation - giving an unrestricted view over the Vercours Massif and the Chartreuse Massif. The residence is associated with another residence in Chamrousse by the same developers which is already constructed and has a pool and a hall for shows etc which can be used by residents of La Grive. Chamrousse is part of the Transmontagne ski domain, one of three dominant domains in the Alps, and with dynamic and progressive views on expansion of the actual ski domain as well as the Chamrousse resort itself - everything pointing to an excellent potential investment! This is borne out by the tourist figures for Chamrousse, which are increasing exponentially season on season. There is the added assurance that English will be spoken by the team in charge of the residence. The yield is 4.5% on the price of the apartment (exc VAT, parking and furniture, as is normal). Rental income to be paid quarterly in arrears, with an increase each year in line with the relevant index. Note that there IS NO PERSONAL USE if you purchase under the leaseback scheme here, but also NO PENALTIES for not renewing the lease after the first lease period of 11 years. Therefore you can invest for 11 years and then opt out of thelease and use the apartment as you wish. Larger apartments available as classic (ie non-leaseback) purchases - sleeping up to 10. 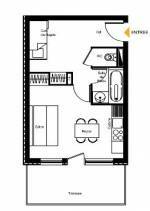 One-bed + cabine - 121,625€ to 153,825€ exc VAT. Then add on 4,181€ for the parking space and 5,550€ for the studio furniture pack or 6,990€ for the studios + 2 cabines and 1-bed + cabine furniture pack (both exc VAT). Add everything together and multiply by 1.196 to get the VAT inclusive price (French VAT is 19.6%). I have separated these costs out so you can work out the rental income by multiplying the apartment costs by 4.5%. • Proche de toutes les commodités : A 30 min de Grenoble, 1h de Lyon et de Valence. • La résidence « la Grive » est à quelques mètres des premières pistes, 200 m du jardin d’enfants, 300m des commerces. • Vue imprenable sur les massifs du Vercors et de la Chartreuse. • Une résidence 3 étoiles entièrement équipée. • Une station en plein développement avec un réel désir d’améliorer son domaine skiable (racheter par la commune à la société Transmontagne). • Les touristes y sont de plus en plus nombreux à venir chaque année. • Une rentabilité très attrayante de 4,50%. • La gestion est assurée par Altitude avec une garantie de substitution par le CCAS (caisse centrale d'action sociale de l'EDF) d'un des premiers groupes mondiaux producteurs d'électricité. La résidence étant louée directement au plus grand comité d'entreprise français (plus de 800 millions d'euros de budget et 5700 salariés), ce même comité d'entreprise s'engage dans le bail de location à se substituer au gestionnaire actuel (Altitude) pour le paiement des loyers. 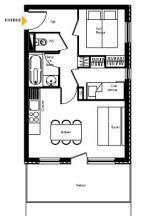 Short Description: March 08 - 29 units left. 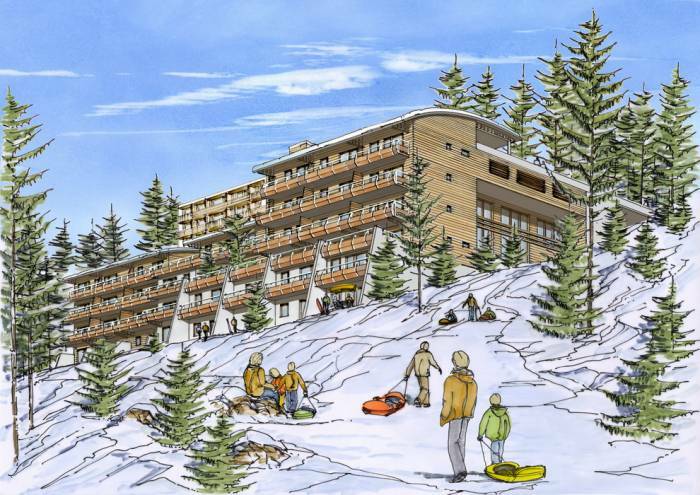 A very stylish new development in the highly popular ski resort of Chamrousse. 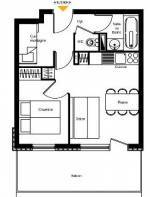 We have studios and one-beds, all with 'cabines' (an extra little room with bunk beds), therefore sleeping 4 and 6 respectively. Excellent prices and returns of 4.5% - no personal use but a penalty-free opt out after the first 11 year lease term. Great investment for personal use later or easy re-sale with excellent capital growth. Click here for more details.